I am the biggest fan of former NBA player Cliff Robinson. I’m sure there are others that will make that same claim, especially in Oregon, but I personally feel I win that fan competition. 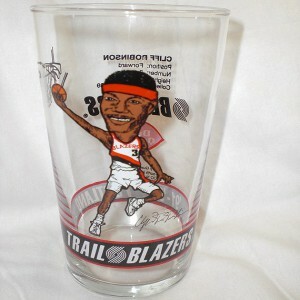 I first met Cliff Robinson at the Oregon State Fair in the early 90’s. I was in grade school, the Portland Trailblazers were my favorite sports team by far (still are, RIP City! ), and stood in line for hours to get my Cliff Robinson rookie basketball card signed. I still have that card to this day, in addition to several Dairy Queen cups with Cliff Robinson’s image on them, wall posters, t-shirts, and anything else that I can find with Cliff Robinson’s name or image on it. As I was getting ready to board a flight to Las Vegas in November to head to a series of marijuana industry events, I noticed that Cliff Robinson was on my flight. I didn’t want to be the 100th person to harass him for a picture and autograph, so I didn’t say anything to him then, but Jay Smoker had a fairly long conversation with him about heading to Vegas. I had no idea what he was doing down there and just assumed he was heading there on vacation. On day 1 of the Marijuana Business Conference in Vegas, I passed Cliff Robinson in the hallway and noticed that not only was he at the venue where the event was being held, but that he was wearing a conference name badge. In my most mancrush voice possible, I said, ‘Uncle Cliffy, glad to see you here!’ To which Cliff responded with a point, a smile, and type of Arsenio Hall fist movement. I then spent the next hour calling friends and family to tell them that basically Cliff Robinson and I became best friends at the conference. OK, that’s obviously a bit of an exaggeration, but I did see him there, I did say hello, and it’s a moment that I will cherish forever. Looking back I wish I would have got a picture. It sounds like I may get another chance, because Cliff Robinson has been announced as one of the top speakers at the upcoming Cannabis Collaborative Conference. The Cannabis Collaborative Conference is the second event in a series. The first event, the Cannabis Creative Conference, was outstanding from what I hear. I wasn’t able to attend, but my friend Kaliko and others told me it’s easy one of the best and most well-organized events they have ever attended. Longtime Trail Blazer Cliff Robinson is now blazing a trail for the use of marijuana as a medical treatment for athletes. Robinson, who recently turned 49, is back in Portland promoting cannabis and will be a featured speaker at the Cannabis Collaborative Conference in February. He was the 6th man on the Blazers team that went to the NBA finals twice in the early 1990s. Robinson, whose 18-year NBA career lasted from 1989 through the 2006 season, said he smoked pot while he was in the league even though it was illegal and against the rules. Cliff, if you are reading this, know that I will be at the event, I hope to interview you for this blog, and I will do my best to keep my mancrush to a minimum. I am so happy to go to this event and not only see Cliff Robinson, but also to hear what he has to say. Cliff is a bright person, carries a ton of weight in Oregon, and with the marijuana industry about to erupt, I’m curious to see what he has to say. I’m also going to lobby him as hard as possible to help out with Oregon reform efforts and beyond. The Cannabis Collaborative Conference will be held on February 3-4. I think there is a pre-event on February 2 as well. You can find out more about the event (and buy tickets) at the event’s website. Also, you can check out the event on Facebook. The event is much more affordable than others of similar caliber, and I hope to see you there!